Why do the eyes produce tears? The lacrimal gland and other small glands located inside the eyelid and on the white part of the eye constantly produce tears to keep the eye moist, lubricated and healthy. How do tears drain from the eye? Tears are produced by glands around the eye and are washed across the eye toward the nose. They drain from the eye through two small openings called the upper and lower puncta, which are located at the inside corner of the upper and lower eyelids near the nose. 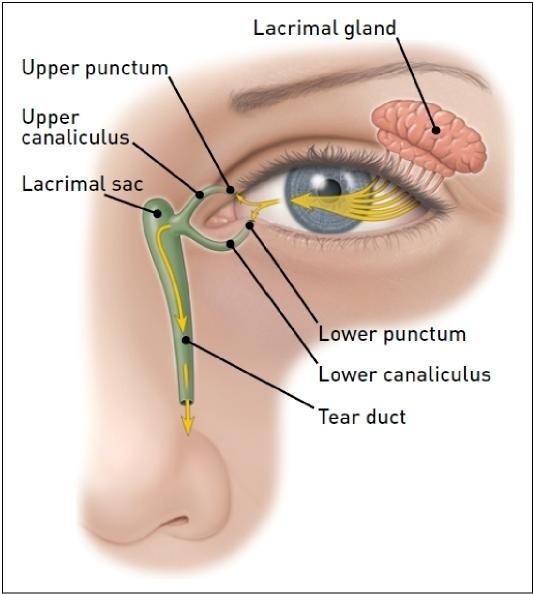 The tears then move through a passage called the canaliculus and into the lacrimal sac. From the sac, the tears then drop down the tear duct, called the nasolacrimal duct, and drain into the back of the nose and throat. That is why your nose runs when you cry. Perform computerized tomography (CT) scanning. How is excessive tearing treated? Dr. Landa will discuss the most appropriate form of treatment with you.